The Chinese culture has a significant influence on the American gambling industry. Many of todays popular casino games were introduced to American casinos by Chinese immigrants. In this review, you can read about some of the most popular Chinese gambling games that had a successful immigration to the West. Pai Gow Poker is a hybrid of American poker and traditional Chinese tiles game called Pai Gow. The original tile game Pai Gow, which means Make 9, is one of the most ancient gambling games that are still available in cotemporary casinos. Pai Gow Poker is played with playing cards instead of tiles and it uses the traditional poker hand ranking. It is one of the most popular casino games worldwide and it can be found in almost every major casino in the US. Its online version can be played at most casinos on the internet. The object of the Pai Gow Poker is to form the highest possible two poker hands, one five card hand and a two card hand, out of the seven cards dealt to each player. Each player competes against the banker that can be either the casino dealer or one of the players who can afford paying the players winnings. Sic Bo is yet another popular casino game with roots that go back to ancient China. The chance game came to the States around the beginning of the 20th century by Chinese immigrants. It can be played in most land based casinos in Macau, the US and the UK. Sic Bo has an online version as well. The meaning of Sic Bo is Dice Pair. It is played with three standard dice on a special table. Each player places any number of bets on the table and then tosses the dice. The outcome is determined by the combinations of the three dice. Each combination has a different payoff according to a payoff schedule, which vary from one casino to the other. Fan Tan used to be the most popular gambling game among Chinese gamblers but the glory days of Fan Tan have already passed. During the 1890s, Chinese immigrants brought the game to the United States. At that time, every Chinatown in American City had several Fan Tan houses that were always full of enthusiastic gamblers. Nowadays, you can find Fan Tan in some casinos in Macau as well as in some online gaming sites. Traditional Fan Tan, not to be confused with the card game of the same name, used to be played with any objects such as coins, dried beans or small buttons on a table with a square marked on it. Fan Tan. The object of the game is pretty simple and odds are 1: 4. The play begins with the banker puts on the table a pile of objects then covers them with a bowl. Each player has to bet on one of the numbers that mark the four sides of the square, or on one of the corners of the square. After the bowl is removed, the croupier removes four of the objects each time until the last group remains. If 1 object is left, then the player who placed a bet on 1 wins the pot, and so on. Mahjong is probably the biggest inherit of Chinese culture to the gaming world. The ancient Chinese tile game has many variants worldwide including variety of online games. According to the myth, Mahjong was developed by Confucius around the 500 BC. The game was brought to the United States during the 1920s and soon was very popular especially among women. The game was played in Chinese style decorated rooms with waiters wearing traditional customs. The American version of Mahjong was developed during the 1930s and it is played in America until today. At the same time, the National Mahjong league was founded. 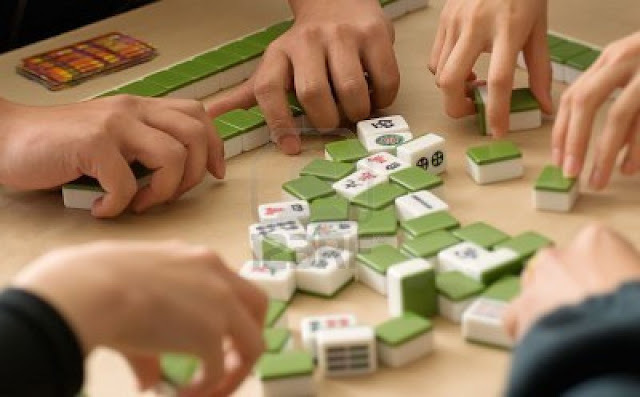 In addition to American Mahjong, there are Japanese, Vietnamese, Cantonese and other variations of the game, which vary from one to the other by their scoring structure, number of tiles and rules variants. In 1998, the China State Sports Commission had set a standard set of rules that will differentiate the illegal gambling game from the skill game.